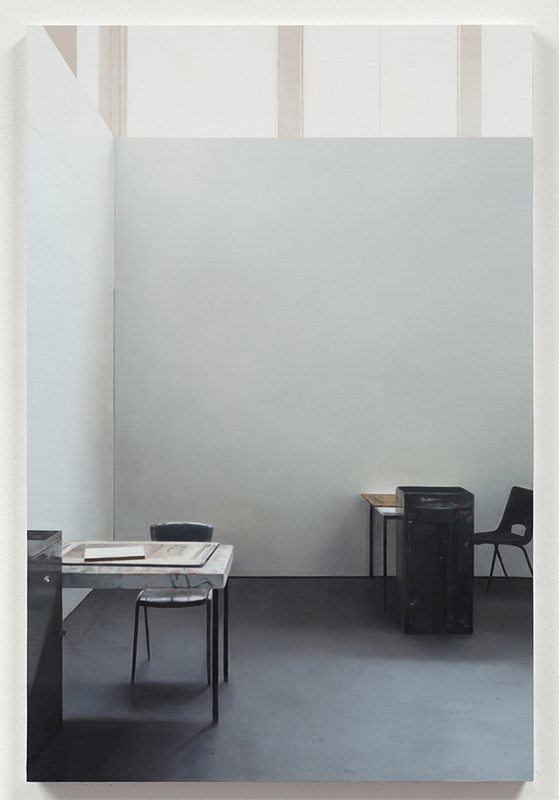 Paul Winstanley, who paints from photographs, uses a process of accumulation of images and then, removing some parts of it or drawing the eye of the spectator to a detail he highlights, he redesigns them entirely. The everyday functionalplaces which are painted by the artist become a sort of abstraction revealed by a subtle play of light, a technique of the colours and by a sensitive composition. Frequently used, these places symbolise a collective experience and show some cultural peculiarities, applied to a different geographical location and to a different temporality. ANNUAL Magazine : In ‘L’œil et l’esprit’ by Maurice Merleau-Ponty the philosopher questions the painters vision, capable of watching without categorizing, in contradiction with the profane, who only considers objects. The composition of your paintings is the result of an accumulation of images. How do you proceed in re-constructing an image ? 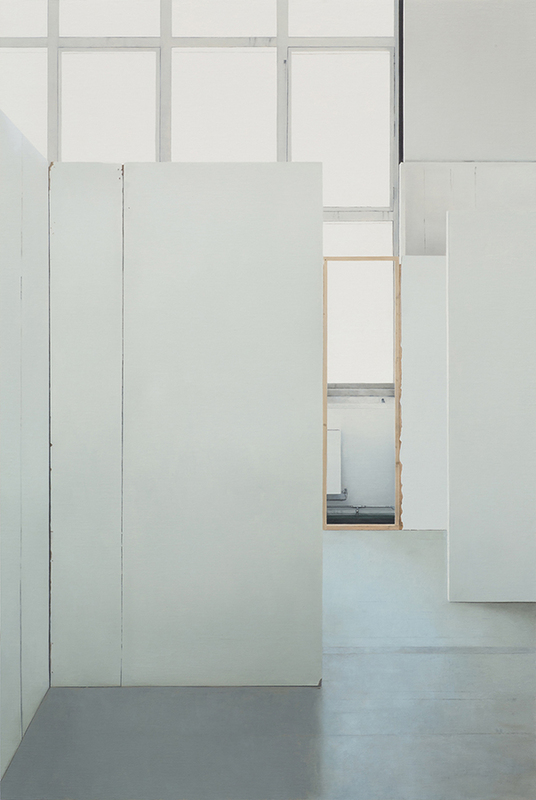 Paul Winstanley : Paintings are ideas in physical and visual form. As such they need to be exactingly made in every sense. The image is a made thing as the object is a made thing. The two work together and are indivisible. The image exists in a painted form, as a surface of paint, in which resides the illusion of other surfaces, places, people, conditions. I use whatever means necessary to construct the image and convey the sense I want to make. I use photography, I use manipulation, I use drawing. These resolve themselves in the painting, in its surface. This is how it is. AM : Your works are inspired by functional places, usually crowed, which you decide to show empty. What made you consider depicting these semi-publilc places ? PW : A Semi-public space is both an abstraction of form, content, space and light and also a documented place. The public arena is a place of shared ownership, shared memory and shared cultural identity. This sharing therefore becomes part of the content of the work. They are places we recognise and know others will recognise too. When they are shown empty of people the viewer of the painting more easily projects themselves into the space. They become, through their identity with and recognition of the space, their own protagonist within the pictorial frame. AM : By removing the social dimension of these places, you lead to a reflection on their function. Is it this objective absence which leads to a kind of abstraction in your paintings? PW : The social dimension is not removed. It is there in the depiction of place as an arena in which social function occurs. Abstraction in the work is more a function of structural underpinning and signalling of intent. This does not remove the social dimension of the work. In contrast I think it can enhance this aspect of its functionality. Such images look to the generic, the schematic and the universal in order to express the specific and re-enact memory in the mind of the viewer. AM : In the exhibition ‘The unassuming eye’ which is diplayed at sobering gallery, you decided to present the Art School series. How did you decide to work on this theme ? PW : This was an idea I held back from for a number of years. First I thought of it as a potential painting project, then, once embarked upon, it became a documentary photographic project resulting in the book ‘Art School” published by Ridinghouse in 2013. Only once the photographs were done did I begin using the material for a new set of paintings. So it became a painting project in the end. It is to be read on many levels. It contains auto-biographical elements, it deals with the sort of abstraction I was once involved with as a student in the 1970’s, it pictures scenes of potential protean creativity, it speaks of the pedagogy of art, it manipulates and creates in doing these things. It is an elegant idea expressed with extreme economy. AM : In order to take photographs of the empty art schools, you visited these schools during summer holidays. Do you think that it is important for you to face and to experience this absence in your creation process ? PW : Having students and their work within the picture would not have worked. This would have been more about portraiture and the specific location. I was not interested in that. I have not even indicated the location of the paintings or photographs in the series. The paintings derive from only a small number of art schools, far fewer than the photographs. It is important they remain anonymous. They express an idea about art school. They are not a portrait of it. AM : In some of your recent works, you chose to include characters in your paintings. Most of these characters are represented alone. Is it, in a way, a prolongation of the the reflection on the absence ? PW : Where figures have occurred in my works, and there have been occasions where I have used the figure, not just recently but back in the 1990’s too, the figure is usually pictured at some vantage point within the pictorial frame. They observe what we observe or wish to observe. They are also usually self-absorbed in some un-dramatic activity such as looking, watching, waiting, talking on a phone, smoking a cigarette. As we look upon it they are you and I within the picture. The viewer is transposed. They are there on our behalf. AM : The concept of the vacuum induced the idea of something. It evokes what is not there. Is it a way to allow the viewer to imagine and project her/himself into the space? AM : In the exhibition ‘The unassuming eye’ at sobering gallery, you decided to show the photographs which you worked from. Do you consider these photographs to be a step in your creative process or could each photograph been considered as an independent work ? PW : The photographs are not individual works. I have only ever shown them en masse, either in the book, as the postcard multiple or as a continuous slide projection. They work together almost like a narrative, feeding off one another. 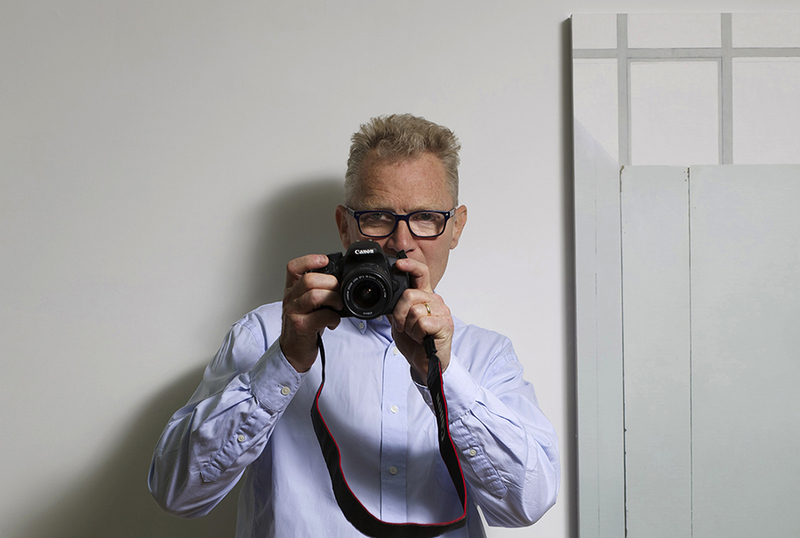 They are not crafted in the way that great photographers craft their photographs. They are mutable, digital images that subscribe to a formula of capture. It is only in the paintings that the images become an individual, individuated thing. AM : What are your upcoming projects ? Did you already decide to work on new themes ? PW : I have several ideas for projects and future work, some of which I will do and others I wont. Only time will tell which might be the stronger, more sustaining ideas. So it is too early to say anything about these things but be assured new and interesting things will happen.